Black Friday is nearing and that means there are people who have been planning this shopping trip long before Thanksgiving arrives. They browse the internet searching for the sneak peek of sales and figure out which items they’d like to buy. I’ve put together a list of important Black Friday Safety Tips to help you stay safe while shopping. You know there will be large groups of people out and about shopping. Most people are only interested in getting a good deal and trying to save as much money as they can, while others want to try and take advantage of this time and of the people. Ask a friend or family member to go with you. You can shop in different areas of the stores to get your items but it is much safer to arrive and leave the stores with someone. Check your cellphone to ensure your battery is charged. Carry it in a safe place that is easy to get to but you won’t loose it. Let your family know where you are going and check in at least once during your shopping trip, just to let them know how everything is going. If you plan on carrying cash while shopping, be sure to stop by the bank or ATM a few days before during the day time hours. Thieves know people are getting money to shop and this is the prime time for them to take advantage. Always, Always, Always be aware of your surroundings. If you plan on carrying a purse or handbag be sure it is one that can fit over your body or one small enough to place over your shoulder. If carrying cash or cards place them in your pocket with your drivers license to avoid your purse or handbag getting snatched. If you know you want a certain item, don’t fight over them. It is not worth you getting hurt or going to jail. The same idea applies to parking spots. Try not to shop alone as this makes you an easy target for those lurking to make a move. 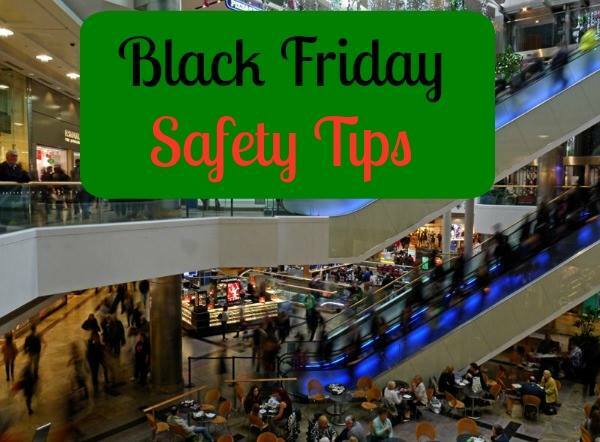 These Black Friday safety tips can help you be aware of things that you may not think of at the time or you may not think will happen to you. Try them out this year when you go shopping. Head over and check out my Black Friday Shopping Tips before you take your trip.